The second game in my review package from Cambridge Games Factory was Ice Pirates of Harbour Grace. 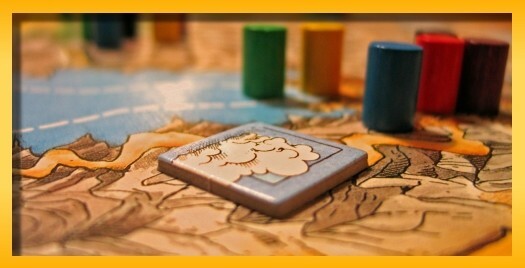 The game comespackaged with the same “Board Games in Bag” concept as doesSneeze and Glory to Rome. Unlike Sneeze, the Ice Pirates bag makes you feel like your really getting something here. The bag is filled with cards, dice, plastic poker-style chips, and little colored clips. I was a little curious how they were going to make the “ice” and “pirate” themes work together but I’m happy to say they pulled it off fairly well. Ice Pirates is a deeper game than Sneeze but still on the light family-fare end of the gaming spectrum. The game setup begins by laying out the face-down cards that represent Conception Bay with Bell Island in the middle. Six ports surround Conception Bay and each of the ports holds special upgrade cards that grant the player additional abilities (jib, telescope, grappling hook, main sail, ice-breaker, and cannon). All ships (a card depicting your ship tucked into the color coded clip) start in the center of Conception Bay on Bell island. Like Sneeze, there is a wind card that indicates the direction of the wind. A little confusing at first but understandably so to make the game mechanics work, the wind can only come from six directions and a roll of the six-sided die determines from which port the wind is blowing. 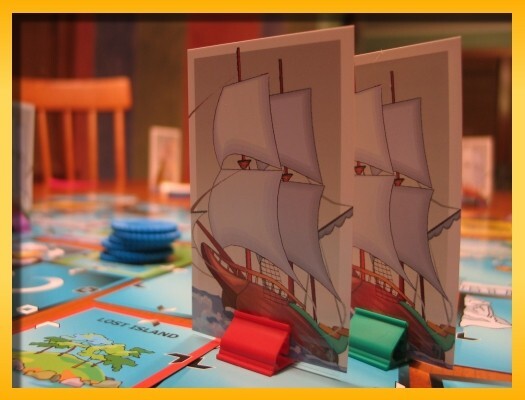 You goal is to ‘explore’ Conception Bay by deciding in which direction you are going to sail and once chosen you turn over the bay card (if not already face up) and move your ship onto the card. You can choose to sail in any of the 6 directions of the wind but sailing with the wind (3 of the directions) gives you the ability to sail one more additional card in the bay. Tacking, sailing in one of the other two directions not directly into the wind, affords you a single move but you lose the ability to move an additional card. Sailing directly into the wind will cost you a crew member chip. As you ply the bay you can stop at one of the ports and if you’re the first, you can obtain the port’s respective upgrade card for free. If you’re not the first, the upgrade cards cost you more and more crew members to purchase. When you lose crew members they always go to Bell Island, and when you visit Bell Island you can get your crew back. The exposed bay cards depict icebergs (that block card traversals), lost islands, additional crew cards, storms, and if you’re lucky a treasure. Visiting lost islands allow you to obtain map cards that will help you find the treasure. When you find an additional crew card, you can raise the level of your crew above the normal level to protect yourself in battle. The dreaded storms can cause a change in the wind direction which may thwart you and your opponents ability to carry out your plans to sail in another direction. 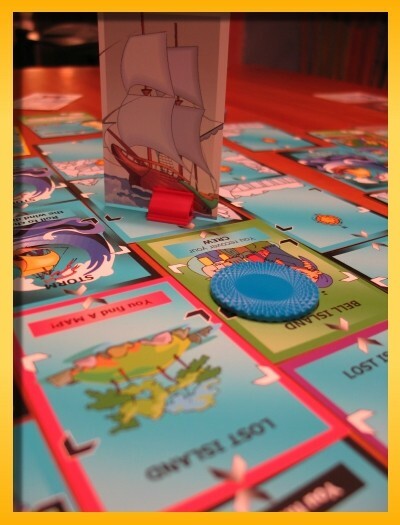 Conception Bay, also holds a treasure card and if you are the lucky pirate to hold all three map cards from the lost islands and the treasure, you can make a run for open water between ports one & two or the port of Harbour Grace. If you make it, you win. Repeated plays tell me though, that you’re going to have to fight your way out. Ice Pirates, comes with battle dice that allows your opponents to raid your ship in an attempt to take your maps and treasure. Raided pirates can fight back in a ‘Swashbuckling’ maneuver but every attempt to fight back costs you a crew member. The battle mechanic seems to keep the dice rolling to a minimum which I greatly appreciate and setting a maximum level of attack (even for ‘rich’ pirates) affords even relatively weak pirates a fighting chance. I’ve enjoyed playing Ice Pirates and my kids seem to like the game play as well. 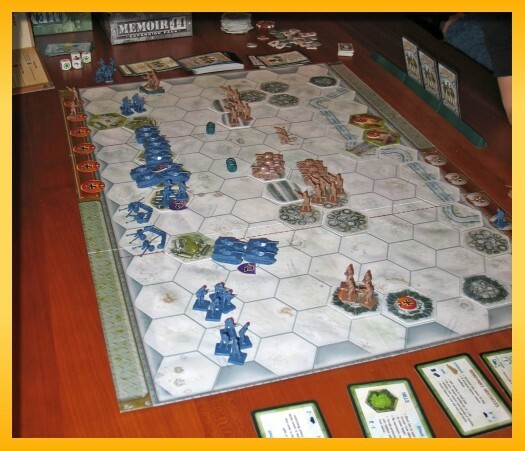 Although more interesting in theme and game play than Sneeze I’m not sure it will see the table as often. Flipping cards in Conception Bay has a somewhat fiddely feel to it and setup is definitely longer. The components are of the same quality as Sneeze but I have the same, albeit picky, complaint of the square cornered cards and the ‘bagged’ rather than ‘boxed’ production. 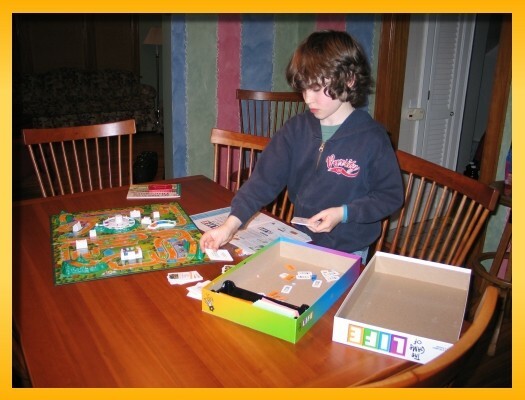 Overall the components are well made for the price-level, and the rules are cleanly written. With Sneeze, our house rule was that when you sneezed, you had to make up what a sneeze might sound like for the allergies in your hand. In Ice Pirates, we continued the tradition by requiring everyone to talk piratey and pronouncing Swashbuckle as “Shwashbuckle”. I can’t explain why that made it more fun, but when your kids come up with their own ideas that make them laugh, it gets a little infectious. Noah wanted to get a quick game in after his shower tonight and after our two back-to-back games of Sneeze. 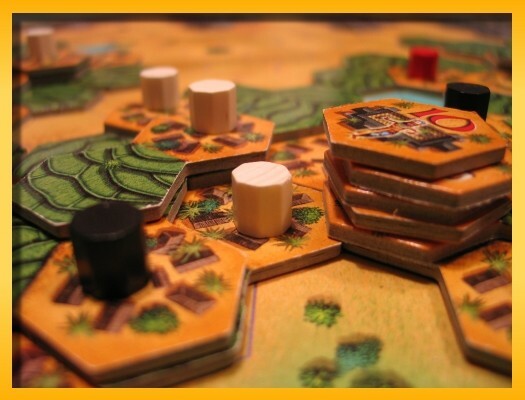 I didn’t have enough time to teach him Jambo, so I went for a quick round of Oceania from Klaus Teuber who you might recognize as the designer of Settlers of Catan, Domaine, Löwenherz, Oceania’s big brother Entdecker, and many others. Through correspondence on BGG and through some private emails with Ed Carter I was able to get my hands on review copies of three games from Cambridge Games Factory. This review will cover only the game Sneeze. I have played Ice Pirates of Harbor Grace but I need to play a few more times and with sufficiently different numbers of players before I’ll feel qualified to give it my best. I’m also itching to play Glory to Rome but I haven’t had a chance to crack the seal on that one yet. 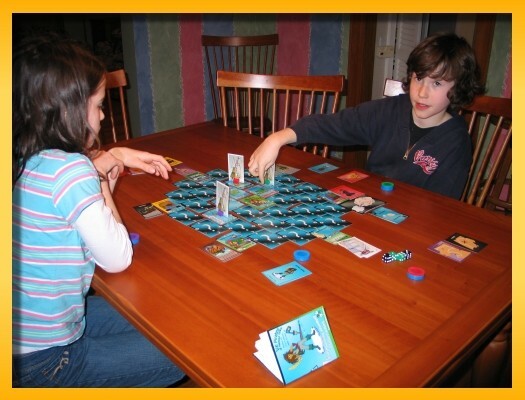 It’s my understanding that they’re still making some rule tweaks to yet another game, Splat! and they’re not quite ready for a review. Ed assured me he’d ship out a copy once the play testers had okayed the changes. 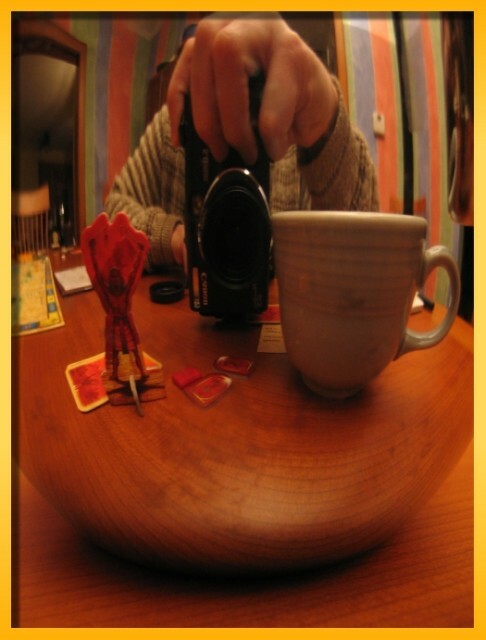 Sneeze is a light family-style game that plays quickly and is really good for all ages. The listed age limit is 6 and up but I wouldn’t be surprised if some younger kids could play along with some supervision from mom & dad. The game plays quickly and is mostly luck-based but it does provide some degree of tactical play that helps the older players stay interested. 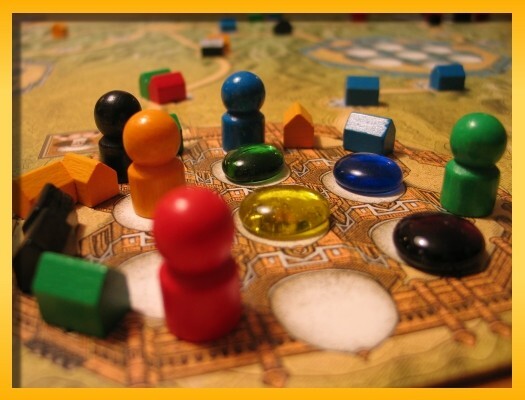 The game does support up to six players which does make it a nice filler/closer game for Euro-gaming groups, families, and friendly gatherings of various sizes. I don’t use the term filler or closer lightly here and I’m glad to have another game in my collection to use to warm up a group and/or to close out the evening in warm-down sessions. 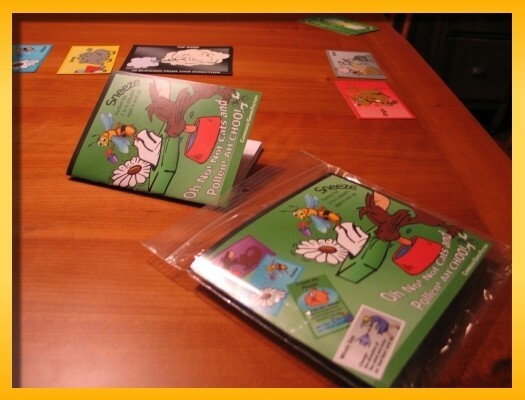 Sneeze is packaged in a zip-lock style bag which provides sufficient containment but the game could benefit from a box. 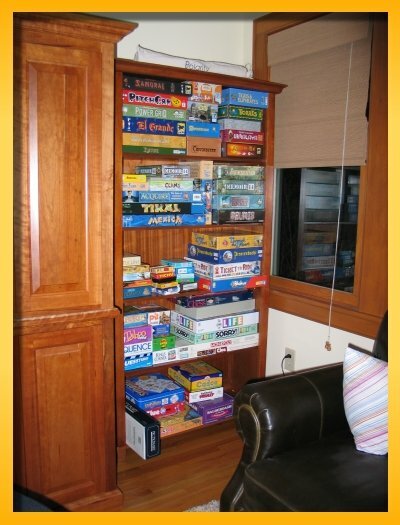 I like to keep a clean Game Cabinet and stacking the bagged games is somewhat troublesome. Box packaging would also provide yet another outlet for displaying artwork and the Cambridge Games Factory logo which they seem to love to place on about every playing piece. The Sneeze cards are well made and the artwork is simple but well done. My only complaint about the cards is the square corners. It is a somewhat picky point to make but it is surprising how often you notice yourself picking the card up by getting a fingernail under a corner causing some damage to the card. Over time (especially in Ice Pirates) this could become a problem. 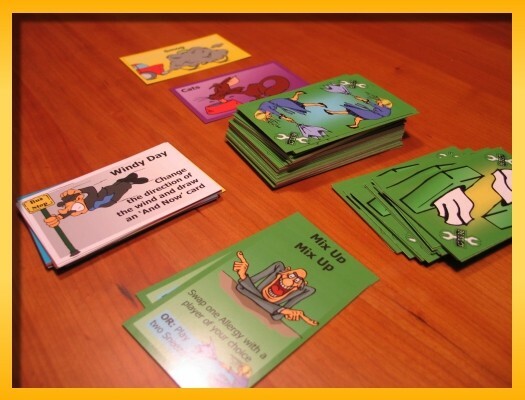 The rules are produced in a booklet-style (3.5″ x 4.5″) and provide ample examples and a straightforward explanation to the game. Sneeze begins with one deck of “Sneeze” cards and another deck of “And Now…” cards placed side by side in the center of the table. Near the decks but to one side, a large “Wind” card indicates the direction of the wind. Between the “Wind” card and the decks is an open space dubbed the “upwind pool”. The other side of the decks represents the “downwind pool”. 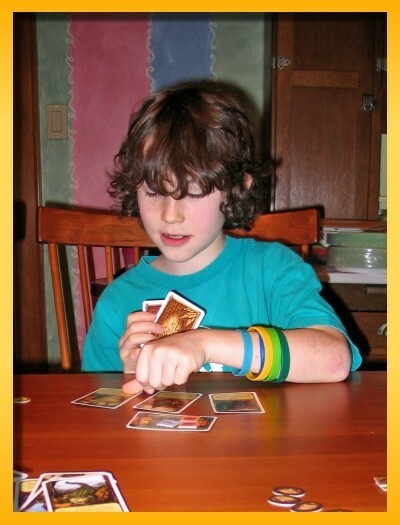 Each player starts with a “Sneeze” card flipped face up in their play area. Play begins with the first player drawing a Sneeze card and without looking at the card, placing it face up in either the upwind or the downwind pools. The face of the Sneeze cards contain colorful images of cats, dogs, pollen, smog, and dust. If the upwind pool contains cards that match all of a player’s face up Sneeze cards, then they Sneeze! When players sneeze, they draw another Sneeze card and place it face up in front of them making it harder for them to sneeze since it takes more cards in the pool to match their hand. Players who make others sneeze and the sneezing player also draw a card from the “And Now…” deck. 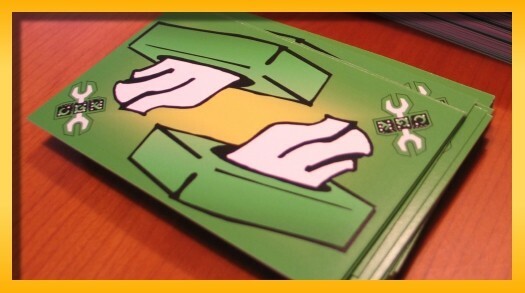 These cards hold special tactical abilities that can be played on your turn instead of drawing a new Sneeze card. 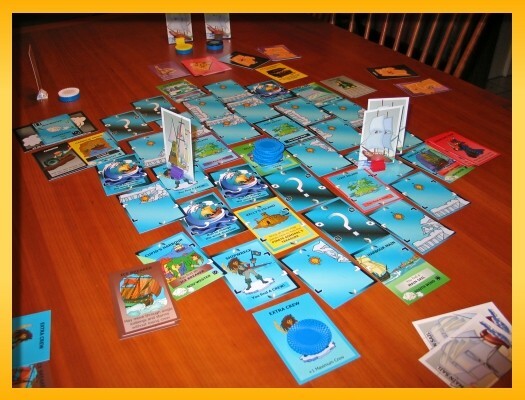 The “And Now…” cards let you manipulate the pools, swap Sneeze cards in your play area with another player, etc. Throughout the game, many circumstances can cause the wind to change direction to the other side of the decks making the downwind pool the upwind pool and vice versa. When this happens, Sneeze cards that were thrown into the downwind pool might immediately make people sneeze. 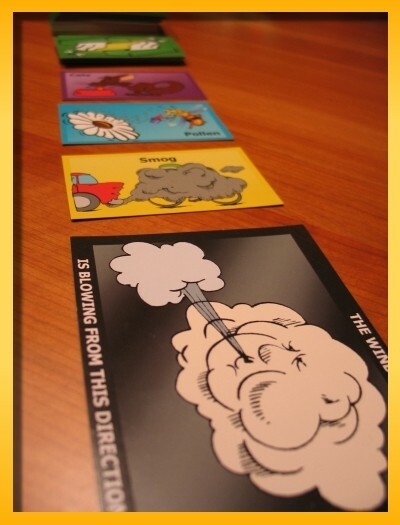 As play progresses, players amass additional Sneeze cards in their areas up to a limit of four. Sneeze has a novel approach to evening out the leaders by making it harder and harder to make people sneeze and by the end game, making someone sneeze will actually hurt the leaders by making them take on additional sneeze cards. The winner is the last person to have less than four Sneeze cards in play or the last person to make someone Sneeze if doing so makes everyone have four cards. I purposefully played Sneeze with my kids to get their reaction to the game and they can’t say enough good things about it. Noah even asked to play tonight without any prompting from me. Although my kids really like it, I wouldn’t relegate Sneeze to the kid’s shelf in the Game Cabinet. I’m happy to have another game on the shelf next to my copies of Coloretto, 6-Nimmt, etc. and look forward to pulling it out again for a quick 15-20 minute game. To say Lisa can’t stand learning a new game when everyone at the table is also learning the game is an overstatement. She did sit and play Amun-Re for the first time with Sophie, Noah, and me. She would, however, rather have somebody learn the game and then teach it to her. I privately think the issue is rooted in her inner-competitiveness coming out. She doesn’t like to be caught flat-footed during the game because the rules were unclear or we played something wrong. Sophie and Noah, on the other hand are real troopers at learning a new game. They are my compatriots. They are usually right in there with me, rooting through rules, laying out the board, playing sample rounds, and figuring out the scoring mechanics. In all cases that I can remember, this has always been at my encouragement. “Hey guys! Do you want to help me learn a new game?!”…”Yeah!”. Today, however, I saw Noah had selected the game of Life from the new game shelf, pulled out the rules, and decided to learn how to play with the insurance and loan options. I’ve secretly hoped that having them help me learn a new game will help them see that the desire to play something new or in a new way outweighs any fear or hesitance at tackling the written rules. There are so many good life lessons that are applicable to this aspect of my gaming hobby and apparently it is sinking in at least a little bit. It warms my heart to see that paying off and it seems only apropos that it was being applied in the ‘game of life’. The AGN Late Show Jan 2006 Gallery is now available. I’ll take a shot at summarizing the evening but I’m really beat so forgive me if I’m not too coherent. We started at 7pm and finished up at 7am and had at our peak, 10 gamers across 2 tables. I was really happy with the turn out, we had plenty of good food thanks to my wife Lisa and contributions from everyone that attended, and I think my house comfortably accommodated the crowd. Tim had to leave around midnight but we had nine until about 4am dropping us to six. Then at 5am we lost another and after a final game of Maharaja we closed down the Late Show, awarded two T-shirts from a random draw (Ken and Keith) and headed to Panera for some bagels and coffee. One observation several of us had was that it’s amazing how many games you can’t play in 12 hours. What I mean by that is that even though you keep your head down and focussed on game play, it’s difficult to get more than five or six games in. I had big plans of playing at least six if not seven games but I was only able to get in five (Java, Elfenland, Terra, Amun-Re, and Maharaja) during the night. Some of it may have been that three of the games I’d never played before (Java, Elfenland, and Terra) but I’m hoping that it was mostly because we were just tired and playing slowly. On my 40th birthday, my wife and friends organized a surprise gaming weekend for just me and my board gaming cohorts at a cabin in a state park south of Columbus, Ohio. When I arrived home from work they sprang their surprise and proceeded to throw me in the car and 45 minutes later we were unpacking huge amounts of food for the grill and I was unpacking a huge box of games that my wife had gotten for me. I had a blast and ever since I’ve wanted to organize another one for the group. There’s really nothing like dedicating a huge block of time focussed on gaming with your friends. Sure, there are cons to go to but this was much more intimate if I’m allowed to use that term with a bunch of guys. We’re all software developers and we all share the same sorts of humor and life experiences. For lack of a better word for it, the weekend was a bonding experience for us. Fast forward six months and I now realize that it’s much harder to organize something like that than I expected and I’ve come to really appreciate the work that went into the first one. Getting dates organized, determing the amount of money people want to spend, deciding where to go, determining how to get more people involved, etc. all proved difficult. In our case, group think started kicking in where some people had ideas and voiced them, others wanted to wait to get involved after the plans firmed up, and still others just wouldn’t or couldn’t commit to anything that far in advance. The biggest issue was that few members of the group are as geeky about games as I am and requiring them to devote an entire weekend and a few hundred dollars to participate would mean I’d be gaming with at most only one or two other people. We finally decided to go the cheapest way we could think of by packing as much gaming as possible in the shortest amount of time to keep the maximum number of people involved. So this Friday, I’m hosting a gaming extravaganza at my house for about 10 gamers that will start at 7pm and will run until 7am when we’ll close down the gaming and head out for breakfast. Lisa is taking herself and the kids over to her sister’s house whose husband, by the way, will be heading over to enjoy the gaming extravaganza. I have to thank Lisa for being so supportive of my hobby. In addition to entrusting me with the safety of our house in the face of the sheer number of unwashed masses, she is also fixing a ton a food us. She’s even got smoked salmon on the docket! She also looked around today for a couple pieces of furniture and found a shelving unit nice enough to have out in our family room and it would be dedicated to storing my games. She said, she doesn’t like buying stuff that looks good but doesn’t say anything about us as a family and having our games out is like decorating. The games represent us so they should be out where people can see them. Wow. 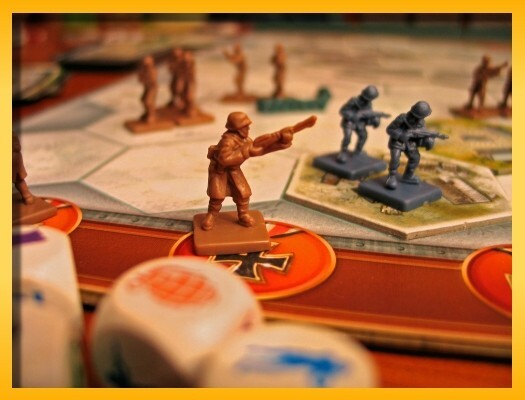 Author mattPosted on January 17, 2006 January 27, 2016 Categories All Posts, Board GamesLeave a comment on Anticipation…is making me wait. Noah and I had a little bit of time tonight so we cracked open the M’44 Eastern Front Expansion and played out the #40 Breakout at Klin Scenario (Dec 07-08, 1941). Noah (Russia) ended up winning 6 medals to my 5. We played the standard M’44 rules and didn’t play the Blitz or the Russian Command rules since we didn’t have much time to do anything but play with the rules we already knew. I’ve played enough games now that M’44 is just beginning to wear a little thin. However, not having played against an adult opponent I’m curious if it’s because of the game or because I’m playing it lightly against young opponents. At a minimum, I’ve found my most photogenic game. 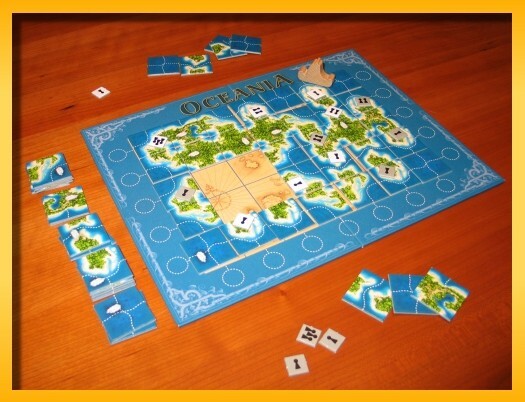 At my maximum, I’ve found another great “Knizia” game. The kids and I decided to sit down this afternoon and work through a sample playing of Amun-Re but this time we got Lisa involved. Lisa likes to play games but she really doesn’t like to participate in the game learning process. She’d much rather be taught the game quickly by someone who already knows the rules. She learns very quickly if you can answer her rapid-fire questions but gets a little frustrated if the answers are along the lines of, “I don’t know. I’ll bet we’ll find that out later”. However, she was a real sport and we all worked through the 12 pages of rules that accompany the game. Somewhat strangely, my 9 year old son beat all of us and to Lisa’s surprise he beat her by just a couple of points. I can tell she’s still trying to figure out what happened. To be fair though, we only played through the Old Kingdom but scored the gold as if we were at the end of the New Kingdom. 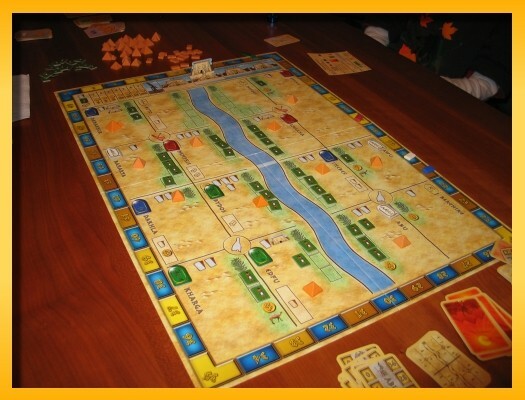 The game of Amun-Re is played across six rounds: the first three represent the Old Kingdom and the second three represent the New Kingdom. Scoring takes place only twice in the game when you reach the end of each Kingdom. Each round is split into five phases but an additional sixth phase of scoring is added in the third and sixth rounds (the end of each Kingdom). Amun-Re is played in Ancient Egypt during the reigns of pharaohs. Players represent rivals who control provinces in which to build pyramids. Players vie for control of a new province every round so by the end of the Old Kingdom each player controls three provinces. At the end of the Old Kingdom, all players relinquish control of their provinces but the pyramids they built remain. In the new Kingdom, players vie again for control of the same set of provinces and the player with the most points wins. In the five phases (six phases if the round is a scoring round) of the round, players bid gold for control of provinces that are up for auction until each player has won a bid. Power cards can be played to thwart the attacks of rivals in outmaneuvering you for control of a province. 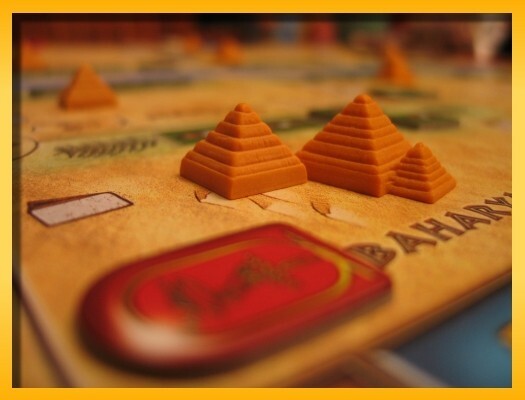 Once the provinces have been won, players take their actions in the order of: purchase power cards, purchase and place farmers in your provinces, and purchase and place building blocks (and potentially forming pyramids – three blocks/pyramid). As in other phases, some Power Cards can be played to help the player accomplish something extra (e.g. building a pyramid with only two blocks instead of three). A price chart on the board enumerates the prices for the items. The prices are not graduated like in Power Grid but instead, each individual good costs the same amount but the amount is determined by how many you purchase at one time. The more you buy, the more expensive each item is. To make matters more complex, each province support a maximum number farmers and the provinces you control dictate the maximum number of power cards you are allowed to purchase. After taking your actions, each player must make a sacrifice to the god of Amun-Re. All players submit cards to an offering pot and everyone turns over their cards simultaneously. The sum of the cards dictates the total value of the sacrifice (the cards are the same cards you use to purchase goods during the action phase and the cards are lost during the sacrifice). The level of the sacrifice dictates the position of the Amun-Re temple on the temple track. The player that sacrificed the most gold gets to choose three goods in any desired combination (power card, farmer, building block). The second highest gets two goods and everyone else gets a single good free of charge. It is possible to sacrifice a negative amount (-3) but Amun-Re doesn’t like that you’ve taken three gold coins from the bank so you don’t get any free goods. 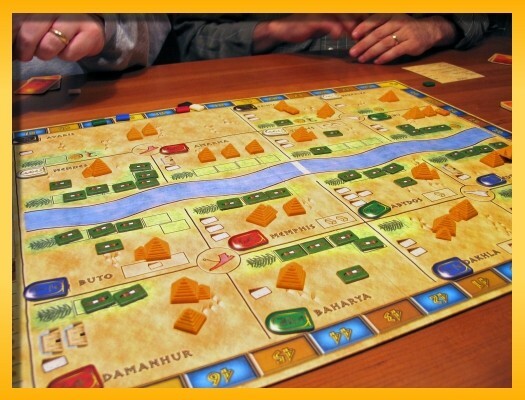 After the goods have been distributed, Amun-Re blesses the river to the degree indicated by the temple on the temple track and players score their position in their provinces by receiving gold for farmer’s harvests and any additional future harvests that their particular province brings. Again, Power Cards can be played to increase or otherwise modify the amount of your harvest. After this phase, the round is over (or you go on to score your position if the Kingdom is complete). As I mentioned, the end of the Old Kingdom requires players to remove all farmers from the fields and relinquish control of the provinces. The remaining building blocks and pyramids stay and the provinces are shuffled and you vie again for control of the same provinces. In this way you may be able to take control of a particularly lucrative province that one of your rivals worked very hard at building during the Old Kingdom. When scoring, the provinces you control, number of pyramids and their relative placement in your provinces, the location of your provinces on the map, and the playing of Power Cards are work together to earn you points on the scoring track. After the second and final scoring, the amount of cash left in each player’s hand also contributes to the final scoring. 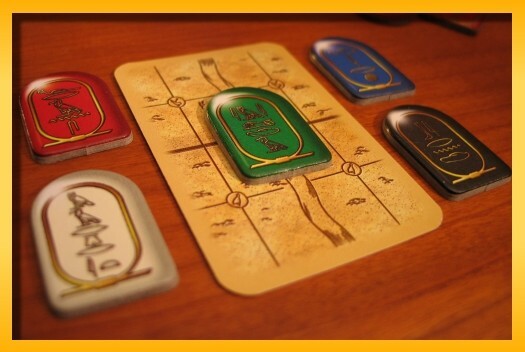 Amun-Re is a complex game and in league with Power Grid. Like most Knizia games, there are many brain burner decisions to be made and at some points it’s just too hard to keep it in your head at once and you have to just give up and play by get feel rather than playing against some mathematical model in your head. Controlling and/or otherwise modifying the level of the Amun-Re sacrifice seems almost crucial to swaying the game but the amount of energy it takes to determine who benefits from a higher or lower level of sacrifice seems almost mind-boggling. I enjoyed playing the game a lot and really look forward to some more plays. Reflections of our playing of Amun-Re in the Bodum -Thermal Press Pot.